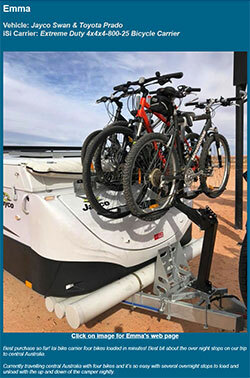 At last a thoroughly engineered and highly effective bolt-on solution for adventure travellers who demand maximum convenience when travelling with bicycles on their Jayco camper trailers. 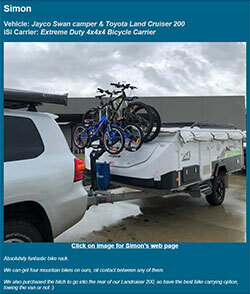 Traditionally the iSi Extreme Duty bicycle carrier is specified by the big hitters in the off-road trailer market and now this bicycle carrier is available to all Jayco camper trailer owners - with the added bonus to swap the bicycle carrier between the front of the caravan and the back of the car and 4WD. Rigorously tested over many thousands of kilometres over the roughest and toughest tracks and terrain, iSi bicycle carriers are precision manufactured to traverse the most severe track surface conditions on the planet. 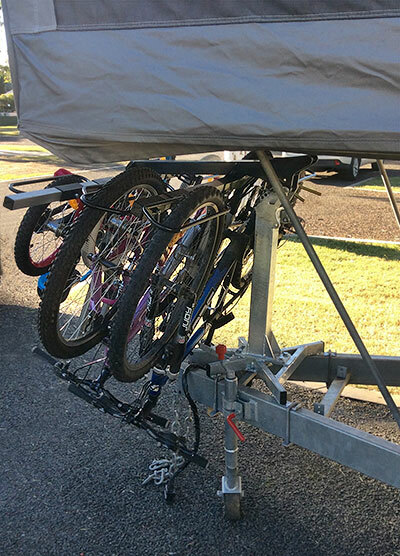 Best of all, iSi bicycle carriers deliver incredible ease of use with lightning quick bike loading/unloading, ultra-slim bicycle loading for excellent trailer articulation and through clever design, eliminate the need for pesky straps as a retention mechanism. 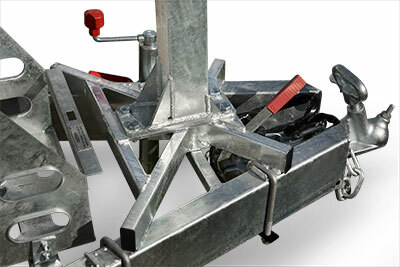 The heart of the bicycle carrier drawbar mount for the Jayco chassis is the iSi Cross-Mount. A practical and super strong mount that bolts directly onto the Jayco A-Frame. This iSi Cross-Mount delivers a very wide and very long footprint in order to spread the load to eliminate pressure hot spots on the drawbar chassis rails as well as to pick up the strongest point near the nose of the drawbar. This totally eliminates the high point loads that result from narrow welded mounts. Moreover, the iSi cross-mount clears the hand brake, jockey wheel and is compatible with most weight distribution systems and stone guards. Retained with four high strength galvanised U-Bolts with tough 8mm thick plates and double-nut lock, this solid mount delivers peace of mind so that you can concentrate fully on the road ahead. 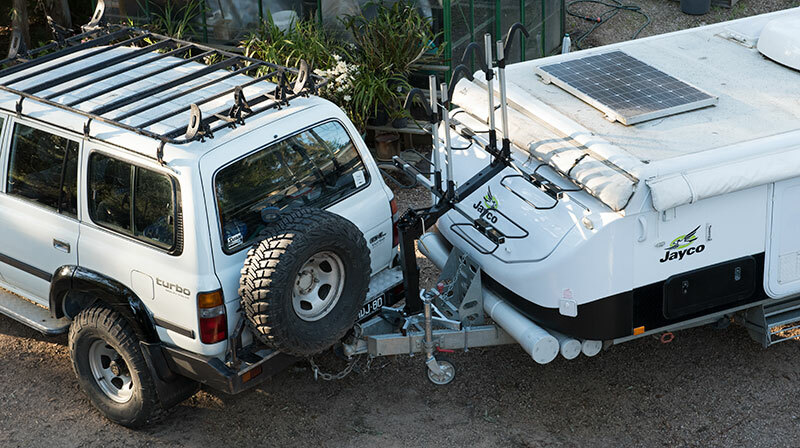 Designed specifically to clear jerry cans, jockey wheels and gas bottles, the wide footprint of the iSi Cross-Base delivers a highly effective platform to support up to four bicycles for zero hassle travel over the harshest terrain. There's more to travelling with bicycles than simply loading them onto a caravan. So many modern caravans today pack a good deal of equipment on the drawbar so clearance in order to access storage boxes and gas bottles. The iSi Extreme Duty bicycle carrier pivots up and forward right at the nose of the carrier for the ultimate in access to drawbar mounted equipment. 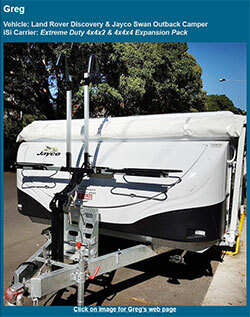 On Jayco camper trailer applications, pivot all the way over to flat in order to deploy the front bed. The maximum convenience for zero hassle travel with bicycles all Jayco camper trailers. 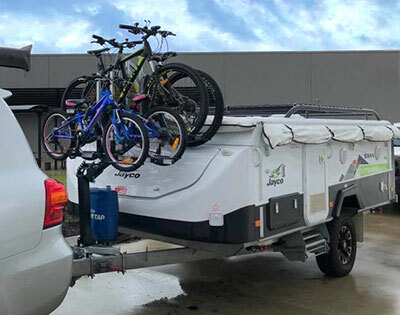 The iSi bicycle carrier comprehensively solves the age old problem of packaging bicycles on short Jayco drawbars whilst continuing to deliver excellent trailer articulation when backing into tight camp sites. Through clever design features the iSi bicycle carrier delivers the most compact load possible so that the entire load is as narrow and as far back as possible. By staggering the bicycles vertically, typical clearance issues such as crank to crank and hub to hub are eliminated so the entire load is made very compact. This results in the greatest clearance possible from the tow point. Moreover, the iSi bicycle carrier is designed to allow the operator to load bicycles exactly side by side and eliminate the need to push bikes left and right in order to have them fit together. 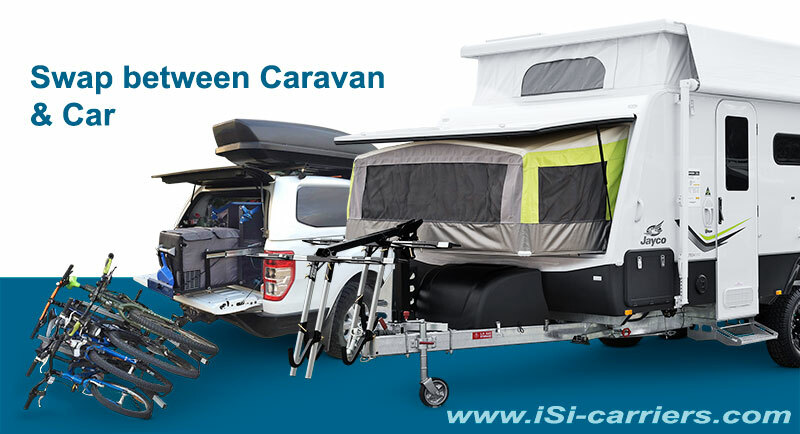 This further enhances trailer articulation by delivering a very narrow load and allows iSi to deliver a drawbar mounted 4-bicycle solution on Jayco campers. There is no avoiding the fact that travelling fast over harsh and corrugated terrain can be tough on equipment when it is not designed specifically for the job. The method which the bicycles are supported is most important - not only where the forces act upon the bicycle, but there the loads go from there to the vehicle. Each bicycle wheel is supported on its own tough mandrel formed tube to support and stabilize each wheel. The *only* contact with the wheel cradle is at the tread and not sidewall. When the going gets rough, regardless of the bicycle wheel and tyre type, we make sure that each wheel is stabilized at two contact points per tyre and that there is never any chance of marking a rim - especially a carbon fibre rim. If a tyre goes flat during the journey, the wheel remains stabilized and protected - and the bicycle secure. This carefully engineered design eliminates the problems of damaged wheels and bearings with traditional platform wheel support that will taco rims and damage tyres. The bicycles are so well stabilized at each end, you never have to deal with fretted wheel and head stem bearings on a hard corrugated trip. For Road Bicycles the same components support, stabilize and protect the most delicate of light weight carbon fibre road and time trial bicycles. We even have several adventure racers around the world who cross the country with sub-7kg time trial bicycles on carbon rims and you don't get more fragile than that. In short, each bicycle is cradled securely with all loads spread through stabilised wheels, not the frame. 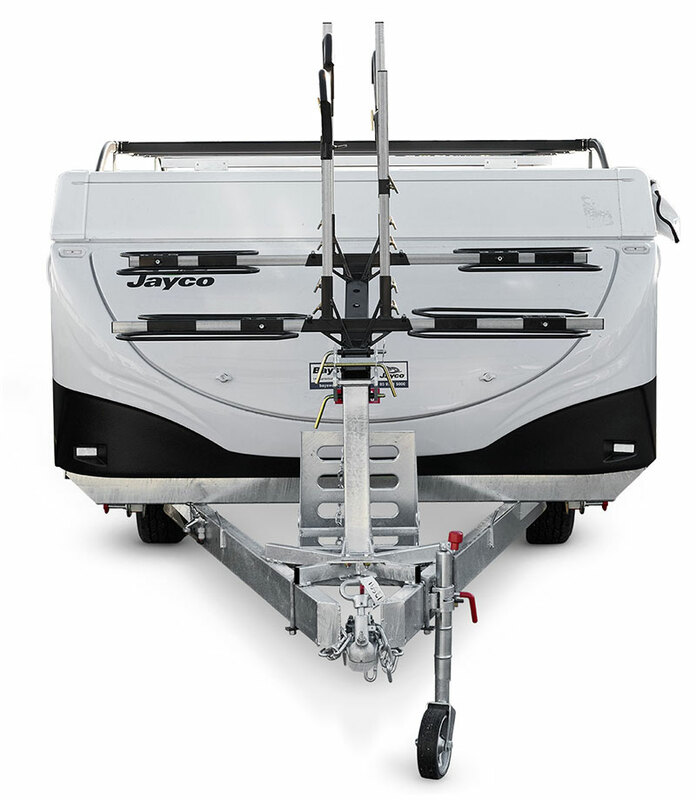 Please note that we will configure the right combination of modular components to suit your Jayco trailer. The Jayco mounting products cannot be purchased online (yet). 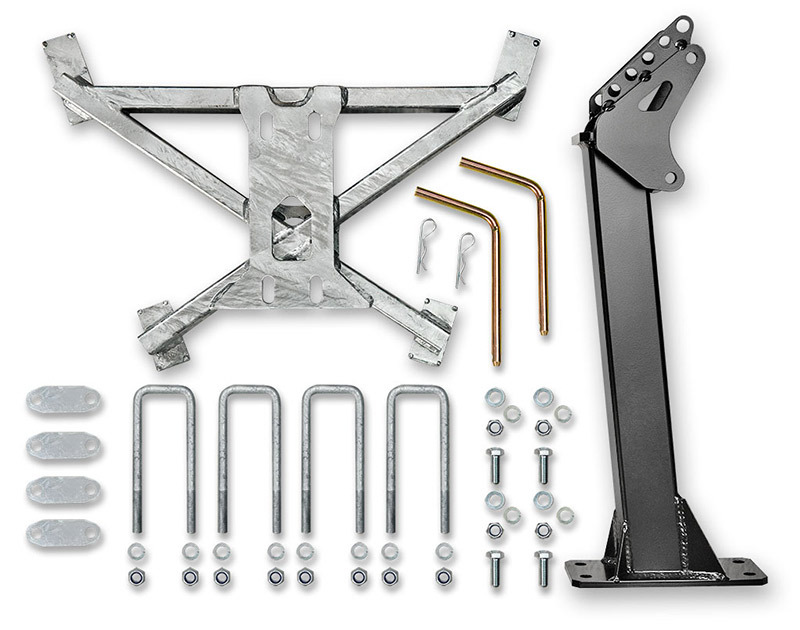 The Jayco drawbar mounting components are supplied as a comprehensive kit ready to bolt directly to your drawbar. Swap the carrier between the trailer and the car quickly and easily. It's great to base camp with the trailer and move the carrier to the car and explore areas that may not be appropriate to drag the camper trailer through. When you have the flexibility you use it to make the most of each trip and because we make it easy to swap, you don't go looking for excuses to leave the bikes alone. 100% Australian and manufactured from 100% Australian steels coatings, and materials. Right down to the welding wire, the shipping cartons and even the address labels on those cartons. It’s not just blind patriotism either. iSi delivers a product that fellow adventurers trust in the harshest operating conditions on the planet. Consistent supply of the highest quality materials are essential to satisfy that demand.